Securing a position as an intern takes well-planned strategies. From an objective point of view, an intern is in a good position to make the step from intern to account executive. There are several points to consider in achieving this goal. Be vigilant about potential internships in top firms during semester breaks or summer vacations. You can gain valuable job experience. If you want to work in PR long-term, focus on that valuable experience in entry-level jobs and internships. Study internship and account executive job qualifications. Spend time reviewing job qualifications for internships carefully. These qualifications are clues to who PR firms hire and why. As an intern, it’s also important to show sales and customer service skills. If possible, work on adding these types of skills to your resume before you need to look for an internship. Volunteer a local businesses, man booths at learning fairs, teach a class, or spend time reading to children at the library once a week. It may not seem like some of these would help, but reading in front of a group helps you develop presentation skills, manning booths helps you find a comfortable way to talk with different types of people. The major part of an account executive’s job is a combination of selling PR services and providing clients with excellent customer service. For today’s interns, qualifications include knowledge of how PR relates to social media. Strategies for entry-level interns. Focus on firms allowing you to add to your existing skills and qualifications. Your primary goal in your search is weeding out the firms that won’t let you do more than be a gopher during your time there no matter how long you are there or how much experience you’ve gained. Of course, you’ll have some of those duties no matter where you intern. But the more time you can work on client projects and with experienced staff members, the more growth you’ll have during your internship. PR interns do “grunt” work like checking sources for media, gathering data to build a client base or providing administrative services for PR events, but those items offer good experience too. Because doing many of these tasks helps you learn who the most viable potential contacts are and how to “sell” PR to clients. 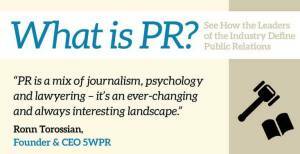 Building your professional PR image. Image in any business is crucial. Building the professional PR account executive image begins in internships. When you know PR is your field of choice, you want to associate your efforts with the best people possible. Don’t accept just any offer, look at the firm and know you are interviewing them just as they are interviewing you. What is their reputation in the industry? Who are their clients and what awards have they won? After you finish your internship you can either go looking for another firm, or they may offer you an account executive position. But whichever way things go, make certain having their name on your resume makes you look good. Sales and marketing skills play a significant role in PR account executive positions. The strategy for the newly hired intern should be to focus on sales and marketing techniques as a continuous learning curve within the PR industry. Sales and marketing skills are a combination of knowing how to talk with people, following up, presentation skills, thinking on your feet, and being creative. Most sales are not made in the first attempt, so the follow-up and getting creative with each approach becomes vital. Dress the part. If you are not certain what that means, wear something you’d see a professional wear. For guys, if you don’t have a suit, that’s okay, but make sure you have a couple pairs of dress slacks, white shirts, and a couple of ties – all with a decent looking pair of men’s dress shoes. Some of the interns may be more casual, and the work environment where you end up may be more casual, but start looking professional. And if you are staying in the PR field, you’ll need the business clothes moving forward. Ladies, it doesn’t have to be a suit for you either, nor does it have to be a dress or skirt. But make sure you look good, and a bit on the conservative side, try dark dress pants and a light button-up top with a blazer or soft cardigan. You don’t have to look masculine or mirror the masculine attire, but don’t get overly frilly either. Once you’ve established yourself in the field, you’ll have seen what others wear and how they’ve developed their style. That should help you do the same. But in the beginning, wear the most professional looking clothing you have and adjust as you find the right vibe for the firm where you intern. Now, what? Okay, you’ve been accepted as an intern, and you’re excited. In your first weeks, you’ll be doing almost exclusively work so the account reps can do what they do best. So when you are photocopying all those papers, read bits and pieces as you can, without slowing the process any. You’ll learn from that. Pay attention to what is happening around you, offer your help when you see someone is busy. If someone is racing around trying to complete a task, watch long enough to see how you could help and then offer. Taking the initiative will get you to the meatier tasks faster in most cases. Stick to work matters in the office and be on time, every day. Many of these things may seem too minor to follow, but your manager will be aware if you are spending time texting or checking in with your friends. They’ll know if you show up late, and they’ll notice when you take the initiative to help others and keep focused on how you can build the company. They’ll notice so much that most of those things will mean the difference between continuing with the firm after your internship, or not. We wish you happy hunting on your internship quest.